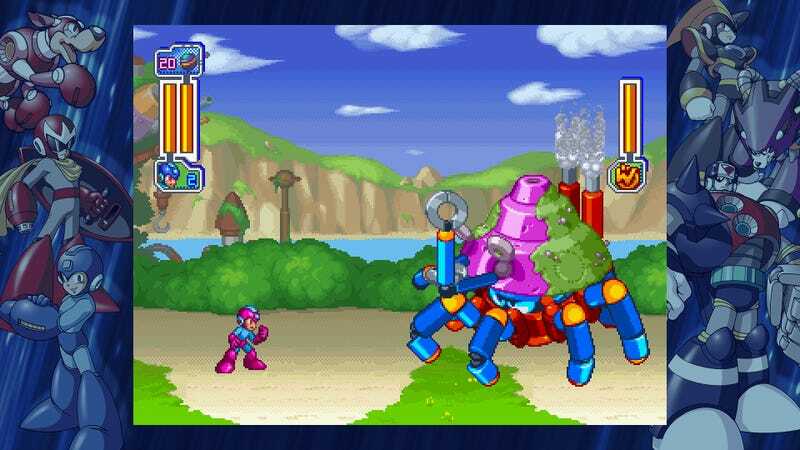 A second collection of Mega Man games is out today, this time including Mega Men 7 through 10. Publisher Capcom skipped Nintendo this time around, releasing the new collection on PS4, Xbox One, and PC, much to the dismay of portable game lovers everywhere. In case you’re not familiar: Mega Man 7 and Mega Man 8 were Super Nintendo and PSX/Saturn games and resemble the (far better) Mega Man X, while Mega Man 9 and Mega Man 10 are throwbacks to the NES era, released in 2008 and 2010, respectively. I’ve been playing around with the latter two (which I hadn’t played before) and can confirm that they are Mega Man games. In other words: they’re nails-tough, full of cheap deaths, and really satisfying to beat. This compilation also comes with checkpoints, leaderboards, and challenge modes including boss rushes and all the other jazz we got in the first Mega Man collection.